It's about the song, not the band. The is a SONGWRITING competition. A great performance certainly helps to communicate the songwriter's intent, but it's the song that counts in the end. To ensure the above, it's judged; it's not a popularity contest. The popular vote is counted only in the event of a tie, where the judges just truly can't decide on a winner. In this respect, I regard SpinTunes as a step up from Song Fu. The competitors have to meet specific, difficult songwriting challenges posed by the judges. This may be a topic, a style, a title, an included phrase, a rhyme scheme, or any combination of criteria that strike the judges' fancy. To make it through this competition, a songwriter must not only be capable of writing good songs, but must be able to write them to a specification, and deliver them on time. This is NOT something where you just can make up anything you want to a title. We're looking for Masters here, not craftsmen. I was really jazzed to see 31 competitors sign up for the first round. Having looked them up on YouTube and on their websites, or having seen them compete in Song Fu or Song Fight, I felt we had a great pool of talent here, and was really looking forward to hearing from many of them. I was also jazzed to see that the first topic was to write a song from the perspective of a superhero or supervillain. This is one that's guaranteed to get people thinking in abstract terms. I myself had three ideas based on established characters... "I'm In Your Head" and "Accepted" (both based on Professor Charles Xavier of the X-Men), and "Emerald Dawn" (based on Green Lantern, whose oath inarguably provides the finest ready-made lyrics in comics history); as well as a fantastic idea for an EP from my son; AND the topic I actually submitted, "Save the World". Most assuredly, the challenge was not too hard. Many of the competitors had an over-abundance of ideas, as did I. So here's the bad news: Of the original 31 competitors, 11 did not complete the challenge. That's a real disappointment. It's understandable when scheduling issues and "real life" get in the way, but I think it highly unlikely that this was the case for all eleven; especially not when the competitors had a full week and a half to tackle the challenge. As a result of this self-selection, all of the remaining competitors advance to the next round. I don't hesitate to point out to the competitors who advance that this is not "by default"... those of you who submitted actually put forth the effort and delivered a product... the eleven did not. Something is better than nothing, so, as you're weighed against the competition, you have moved on purely through merit. That said, I hope that at least some of those who were eliminated this round continue to follow the competition and submit shadow entries. This should be about meeting personal challenges, not about winning or losing. Fortunately, the bad news is balanced with the good. The entries that were actually made were stellar. I can't express how pleasantly surprised I was at the variety of the entries and the quality of the submissions. Everyone from JoAnn Abbot (who isn't even a musician, and for whom this is her first ever competitive entry) to Edric Haleen (who has 13 prior rounds of Song Fu under his black belt) gave their very best, and made this a tough, tough round. Kevin Savino-Riker, "Tough Jobs vs. Iron Gates". This is supremely listenable, a great tune, and a great concept. It's awesome that both characters are cast in the role of villain and hero simultaneously. In the end I didn't vote for it because it stretches the definition of super-hero and super-villain too far. Other people met the challenge more squarely. Denise Hudson, "Invisible Girl". I think this is a gorgeous tune, and Denise absolutely hit the concept of "Invisible Girl" squarely on the head. What's more, I love it because it's the answer to a Question I had posed earlier in the week... "Flight or Invisibility?". Denise takes us on a tour of the Invisible Girl's psyche, and fully deserves a vote. But I have only three. Bram Tant, "Kebab Shop". This is hands-down the best song Bram has ever submitted in competition. I really, really love it. REALLY. I was [this close] to voting for it, but did not simply because his villain, while creative and astoundingly original, is a little too close to reality, and a little too subtle in his operation. A super-villain is best when larger-than-life; I get the feeling that Bram's villain may actually be operating in any major city at this very moment. Sara Parsons, "Starlite (Ballad for a Noble Steed)". This is arguably the most surprising, right-out-of-left-field submission. I would have never considered Rainbow Brite's horse as a topic! But you know what? It works! And it squarely meets the challenge! And as always, Sara's execution of the concept is superb, with her melt-your-heart voice used to full effect. But I only have three votes. The same goes for Godz Poodlz' "The Human Bomb". I'm a huge Poodlz fan, and I wish I could vote for them every time, but I just can't. Caleb Hines, "Clockwork Man". Caleb spins a Victorian gaslight fantasy that draws you in from the very first peel of Big Ben in the superbly orchestrated introduction. Though he was built by a mad inventor to protect humanity, Clockwork Man was built without a heart. As a result he will dispassionately dispense with the life of an individual to save a city. You can't argue with numbers. This is original, shocking, well-executed steampunk fun. I'm still geeking out over it. Ryan Welton, "Underdog Blues". Ryan gave us one of the very few entries based on an established superhero, and he did it with panache. This is a really fun, catchy tune which has already found a home on my MP3 player. Ryan met the challenge squarely and competently with not a hint of grey area. He just did a really, really good job, and that deserves to be rewarded. Edric Haleen, "A Letter to Humanity". "Method actors" are a dime a dozen. Edric is only "method musician" I know of. In the week leading up to the listening party, Edric manipulated the expectations of the audience in Artifiction chat, the better to showcase the signature "big reveal" in this song. 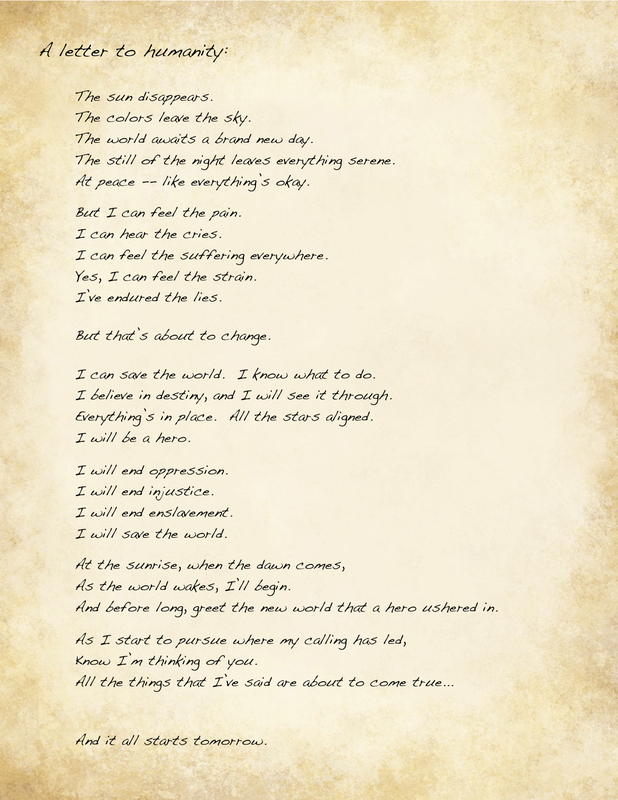 He actually posted a scan of the "actual" Letter to Humanity as his lyric sheet as a "feelie" reminiscent of the old Infocom adventure games. He is an entertainer par excellence, and I don't think he's ever gotten the kind of response he deserved in Song Fu. But, judging this song purely on its own merits, and pointedly ignoring the drama, I couldn't avoid the conclusion that it still deserves my vote. Edric has orchestrated a string accompaniment, a soaring tune, and meticulously crafted lyrics to take you exactly where he wants you to be emotionally. This is simply a great song. A lot of thought went into it, as you can read here. Voting is open until June 29, 2010, 11:59 pm EDT. If you haven't already, please go to http://spintunes.blogspot.com, listen to the entries, and cast your votes now. Great summary of what SpinTunes is all about. And thanks for putting Godz Poodlz up in your honorable mentions. Dave, thanks so much for this writeup! Your thoughts on this topic are, as always, astute and valuable. I can't help but agree with everything you said. Thanks also for critiquing my song; I intentionally strayed from classic definitions of superheroes in order to stand apart from the competition, but the line I was walking may have been finer than I thought... that hadn't occurred to me until I read your review. I will contend that as portrayed, both my characters *believe* they are superheroes, which was my real point in the first place; thing is, if I had sold that well enough in the song itself, you wouldn't have come to the conclusion that you did. I'll chew on that for awhile and it's going to factor heavily into my next submission. Again, thanks for a great article and a great contribution to SpinTunes! I'm looking forward to your next shadow. we're happy it made it in time for the listening party. I'm looking forward to shadowing for the rest of the challenges and to seeing what these folks come up with. There are always surprises around the corner here. I'm glad I haven't stepped on any toes. I have the utmost respect for every entry in this round. In the end my choices came down to the very tiniest nitpicky differences, as with your entry, Kevin. I knew what you were doing, and I loved it, but when the choice comes down to that and another great entry that uses a more classic definition... *shrugs*. Anytime an artist sticks his neck out he's taking a risk. Kudos for taking that risk. Thanks for reviewing the round Dave, and especially the shadow entry. "I'm In Your Head" would have been an exploration of Professor X's power of telepathy. He has the ability to enter another person's mind and not only read it, but insert thoughts, and make them believe whatever he wants them to. It's quite possibly the most frightening superpower a person can have. In this song he would methodically pick the villain's brain apart while calmly explaining what it is he's doing. In the end, that was just too damned cold. He came across as not a hero at all. Well, he had the motivation of a hero, but the methods of a villain. Or dentist. "Accepted" would be an interview between Professor X and the parents of a young mutant he had accepted into the Xavier School For Gifted Youngsters. I rejected this one because, though it was in first person, it was not so much from his perspective as it was about him just describing other stuff. So out it went. I was really close to going with "Emerald Dawn" (the Green Lantern idea), and using Hal Jordan's oath as the chorus... it's really everything the competition is asking for. My kids wondered whether I would run foul of copyright by using the oath. I think not, as I'd wrap it up in enough social commentary to make it Fair Use. And I really LOVE the tune I set it to; so much so that I found myself humming it in the car today. It was my son's reminder to me of Mr. Incredible's complaint and the lure of applying that to my own hero (thus making a larger story arc) that lured me into reviving Yesterday Hero and expanding his backstory. Hey, there, serious kudos for your shadow entry, which I really loved and very well might have made my top-3 vote if it had come in on time. Nice write-up here as well. I wish I'd gotten the opportunity to hear what you thought about my song. On that note, I could be wrong, but at the listening party, I thought someone named Dave might have suggested that my song didn't meet the definition of the challenge, and I see here that you mentioned specifically that failing to meet the challenge meant not getting your vote even if you loved a song. I've no delusions about my song (and especially my vocal) and am fine with whatever you may have thought of it, good or bad. On the chance that you might have made that comment Thursday night, or the chance that whoever else it might have been may come across this, I thought I'd share this link to the story behind my song -- http://theoffhandband.com/2010/06/step-back-swooperman/?postTabs=1 -- which makes clear (even if the song itself may not have) that it is the origin story of a supervillain. For anyone unconcerned about whether or not I met the challenge and just interested in the story behind the song, enjoy! And Dave, truly feel free to not say anything about the song here, I'm not fishing for anything, just trying to clear my good name with respect to the heeding of the challenge! ;) Take care.